Another delicious low-carb way to eat pizza. 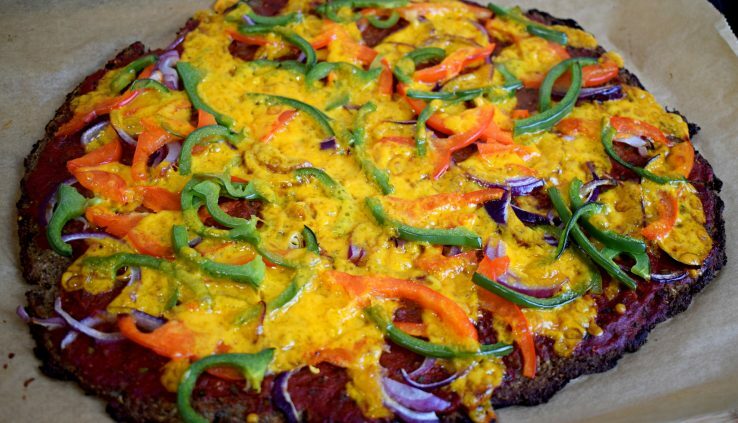 While this cauliflower crust may not taste like the traditional empty white ones, it’s an excellent base to carry tomato sauce, vegetables, and lots of cheese. The result is well worth the preparation time. I’ve known about these crusts for a long time but never made one before. I happened to have seven heads of cauliflower, and an upcoming dinner. My guests were going to be treated to a wonderful experiment! I tried four variations, and we agreed this recipe was a good balance. My very first test crust tasted great, and was crispy, but quite thin, and tore easily while handling. I don’t want to publish a recipe that’d likely end in frustration. You’ll notice there’s no egg in this recipe. As per usual, I like the challenge of making something vegan, and low-carb. This makes it hard to create a binding agent for the cauliflower. I’ve been using a lot of flax flour lately, which is loaded with fibre. Adding soy protein naturally helps bring up the protein content. I call this a basic dough as I don’t add any spices beyond salt. The cauliflower has a strong taste, and you’ll be loading it up with pizza toppings. I’ll likely come back and create variations of this crust incorporating more spices. Feel free to experiment — I’d suggest rosemary and pepper as a good start. A big package of bamboo fibre arrived at my kitchen on the day I was doing these crusts. I tried one using the fibre instead of the flax, soy, and cornstarch. It created a decent texture, but man was it dry. I’ll definitely be trying more with this — I can probably add a bunch of fat to make this more rounded and delicious. Please send us your pictures of pizzas on Instagram and Pinterest (use the social buttons). Preheat the steamer, bring to a boil then reduce to a simmer. Alternately you could boil the cauliflower, but you will need to strain it afterward, and it might be a slight bit softer. Remove the leaves from the cauliflower. As the cauliflower will be ground up you can leave most of the stem intact. Chop into small enough portions for the blender. Blend the cauliflower into rice size bits. If you have a small blender, you may need to do this in 3-5 portions. Put the cauliflower bits into the steamer. Remove the cauliflower bits from the steamer and let it cool. Dump the cauliflower bits into the center of a cheese cloth, bundle the cloth together and squeeze out as much water as possible. Mix the soy protein, cornstarch, and salt in a mixing bowl. Add the water and mix until you have a consistent gooey mixture. Add the strained cauliflower bits and mix thoroughly. Place a sheet of baking paper on the baking tray. Spread some flour on it to prevent the dough from sticking. Dump the mixture onto the baking paper and form it into desired pizza shape. It should be around 5mm thick, but thicker is not a problem. If you make it thinner it gets crispier, but becomes challenging to flip. Flip the crust over. It can stubbornly stick to the paper. In this case place a second sheet on top, flip it over, and carefully peel away the first sheet. Bake for another 20-30 minutes until brown. Remove your tasty crust from the heat. Complete your pizza now, or leave it for later. These hold well over the day.